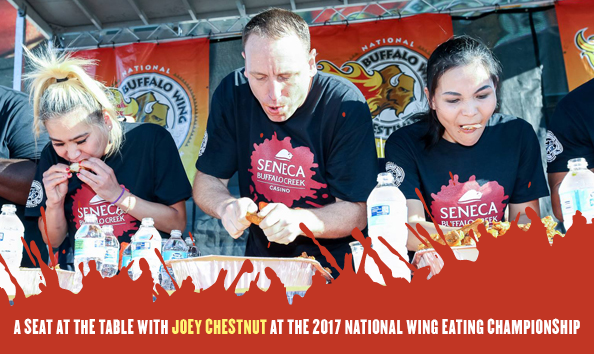 Professional competitive eater, Joey Chestnut defends his title at the National Wingfest on September 3rd in Buffalo, NY. You may know him from his hot dog eating fame as the man who consumed 72 hot dogs and buns in ten minutes. Here’s your once-in-a-lifetime chance to go head to head, or should we say, wing-to-wing with a legend! Eating this meal would be like taking batting practice with Babe Ruth… or “playing horse” with Michael Jordan! Be at the table as the platters are served! 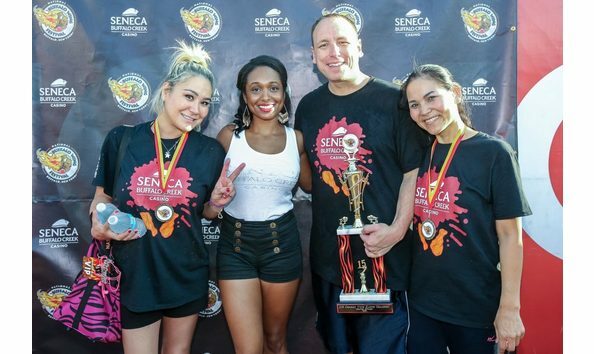 The eyes of the competitive culinary world will be on Coca-Cola field that Sunday. This item is an entry into the U.S. Chicken Wing Eating Championship and a seat with Joey Chestnut himself. Entrant will be awarded an exemption on behalf of Major League Eating in order to compete with the professionals. 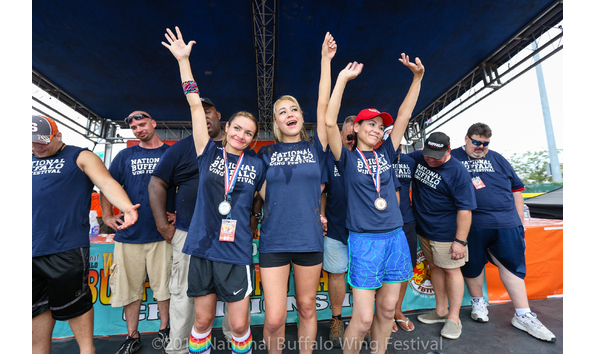 Last year, this gastronomical god consumed a side-splitting 188 wings…11 more than his closest competitor and outpacing the last in the pack by 154 wings! But don’t let those numbers dissuade you! You could lose the competition and still be a winner. That’s because this bid is for a good cause! Your money will be used for one of the finest food related experiences Western New York has to offer, but we don’t mean wings! Your money will go to Meals on Wheels for WNY. Serving the elderly and shut-ins of W.N.Y., Meals on Wheels for WNY represents more than nutrition – for many, those connections are also their lifeline to the outside world and their safety net. The auction opens 9am Saturday, August 26, 2017 and closes at Thursday, August 31 at 5 pm. Winner will be announced on Friday, September 1 at the Anchor Bar in Buffalo, NY.